Normal household timers are not built to take the high inductive loads produced by HID ballasts. If used with an HID ballast - the contacts inside the timer that open and close the timed circuit will overheat and weld together - breaking the timer and leaving your grow lights permanently on. The LUMii Heavy Duty 24 Hour Plug In Timer is different. It is designed to take high loads and has no problem dealing with the inductive loads produced by a 600 watt ballast. This means no separate contactor is required and saves you money. It has a 96 switching operations within a 24 hour period (every 15 minues). This timer is suitable for timing one 600w HID ballast or up to 6 x 200w CFLs. 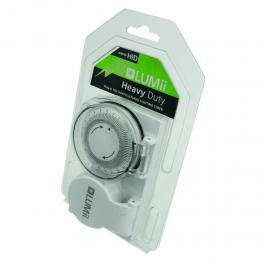 It has a robust 'inline' case design with socket and timer dust covers.